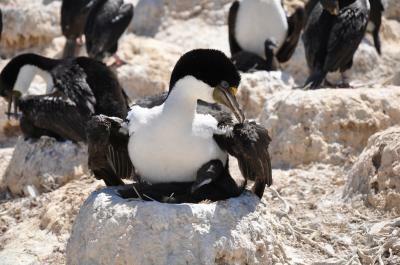 A team of researchers from the Wildlife Conservation Society (WCS) and the National Research Council of Argentina recently fitted a South American sea bird called an imperial cormorant with a small camera, then watched stunned as it became "superbird" -- diving 150 feet underwater in 40 seconds, feeding on the ocean floor for 80 seconds where it eventually caught a snakelike fish, before returning to the surface 40 seconds later. This is the first time researchers have been able to watch first-hand the amazing feeding techniques of these fascinating birds, which occur off the coast of Argentina. The footage shows the cormorant briefly on the surface before diving for the bottom. The camera is attached to the bird's back, so the view is of its head as it pumps its feet to swim deeper. When it finally reaches the ocean floor, it explores a vast area searching for food. It eventually finds an elongated fish, which it brings to the surface to eat. The footage came from Punta León in Patagonia, Argentina, a coastal protected area supporting more than 3.500 pairs of imperial cormorants. A WCS scientific team, led by Dr. Flavio Quintana, has been studying the cormorants' feeding behavior for the past ten years. The team was joined by Dr. Carlos Zavalaga along with Ken Yoda from the University of Nagoya, Japan to fit the camera on the bird. The WCS team has tracked more than 400 cormorants along the Patagonian Coast of Argentina using cutting edge technological tools such as multi-channel archival tags and high resolution GPS-loggers. This information will help identify priority feeding areas to help design new protected areas and to understand environmental conditions that affect cormorant populations.